Russia did not attend a planning session held in Washington in late October for the 2016 nuclear security summit, casting doubt on its participation in the summit. In a Nov. 5 statement, the Russian Foreign Ministry said Moscow “does not see any possibility to take part in the preparations” for the upcoming summit, which would be the fourth installment of the biennial meetings. The summits are the most visible feature of an accelerated international effort to prevent nuclear terrorism. U.S. President Barack Obama launched the effort as part of his speech in Prague in April 2009. Summits have been held in Washington in 2010, Seoul in 2012, and The Hague last March. The 2016 summit in the United States is scheduled be the last. In its statement, Russia questioned the need for that meeting. The statement expressed “grave concern” with the proposed framework for planning the summit. According to Russia, the planning process privileges the hosts of the previous summits in the drafting of the preparatory summit documents. Officials from several countries confirmed that some states have raised some objections to the process. But a main purpose of the planning meetings is to air and resolve such objections, Laura Holgate, senior director for weapons of mass destruction terrorism and threat reduction at the U.S. National Security Council, said in a Nov. 17 interview. In a Nov. 26 e-mail to Arms Control Today, a European official said that “[n]ew proposals concerning the organization of the workshops have been made.” The official wrote that “[i]t is logical that each host is willing to influence the way the summit goes,” but emphasized that “nothing is set in stone at this stage,” as the proposals are under negotiation. “What matters is to preserve the consensus rule,” the official said. At the summits, participating countries have announced steps they would take individually and collectively to increase the security of fissile materials. These steps have included the removal of nuclear materials, enhancement of capabilities to counter nuclear smuggling, creation of centers to improve nuclear security and training, and ratification of international agreements and conventions that govern nuclear security. Russia’s decision to boycott the preparations for the 2016 summit comes on the heels of a downturn in relations with the United States over Russian military intervention in Ukraine. But Kenneth Luongo, a former senior adviser to the secretary of energy for nonproliferation policy who is now president of the Partnership for Global Security, said Russia’s absence from the October planning session goes beyond the current crisis in relations over Ukraine. It is another step in a decision that Russia has made to “wind down cooperation” with the United States on nuclear security, Luongo said in a Nov. 21 interview. Luongo, who is a member of the Arms Control Association Board of Directors, said the backsliding began with Russia’s insistence in 2013 on a pared-down replacement for the old Cooperative Threat Reduction program. (See ACT, July/August 2013.) That was followed by limited action from Russia at this year’s nuclear security summit, Luongo said. Russia notably failed to endorse a key initiative from the summit, formulated by the Netherlands, South Korea, and the United States and joined by 32 other countries. Luongo characterized Russia’s behavior as “irresponsible” and warned that U.S. options for convincing Russia to change course are limited. “You can’t throw a life preserver to someone floating away from you,” he said. Russia said that it informed the United States of its decision not to participate in the 2016 summit preparations in mid-October. Of the 53 countries that attended the 2014 summit, Russia was the only one that did not participate in the planning session. 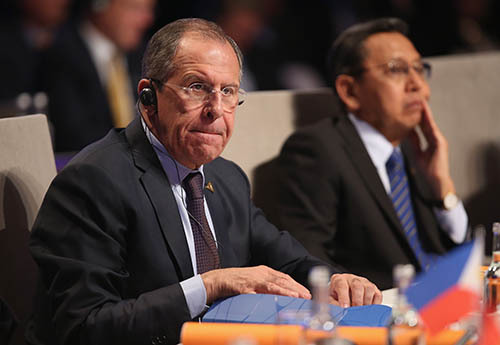 In spite of its negative tone and its expression of “doubts regarding the added value the 2016 forum,” the Russian Foreign Ministry statement did not explicitly rule out Moscow’s attendance at the 2016 summit. But one high-ranking Russian official went beyond the statement. “We are not planning to attend the summit,” said Sergey Kislyak, the Russian ambassador to the United States, during a Nov. 5 discussion with reporters at his home in Washington.